I’m most productive if I get my writing done before the rest of the day starts. Once it gets to nine or nine-thirty, I feel compelled to check and respond to email, comment on and promo my group blogs, and stop by Facebook and Twitter. If I sleep until eight, eat breakfast, and deal with the dog, then by the time I sit down to write, the precious early hours are gone. I’m a night owl by nature, and while I get up to kiss my teens goodbye before they head to school, it’s hard to resist the call of the warm, cozy bed once they’re out the door. But the lure of more sleep leaves me frustrated with myself by the end of the day. The word counts don't stack up the way I want, and other “urgent” tasks get in the way. When I let my body rule my day, I work, but don't produce what matters to me on a consistent basis. I decided I needed a boss to keep me in line, and since I work for myself, I had to step up. The answer—at least for me—was simple. I had to go back to the practices I’d used when I worked full time, back when I worshipped time management gurus like Brian Tracy and Franklin Covey. I had to determine my priorities and plot my next day in advance. I had to plan it out the night before so I'd have a reason to get up the next morning. Once I could see in writing how my day needed to play out, I was motivated to get up to make it happen. Rather than clutter up my digital calendar with things like “write”, “check email” and “work out”, I’m using a small white board. Easy to see from my chair and easy to modify if my schedule changes. I’ve fallen into a schedule where I get up to see my kids off to school—or sometimes earlier—and then stay up. I make my oatmeal, feed and let out the dog, and then write for about 90 minutes. I don’t always produce as many words as I’d like, but I’m doing much better than before. The key is putting in the time. Once the writing is done, I don’t have to feel guilty about working on all the other stuff that I want/need to do, some of it writing-related, some of it not (I didn’t originally quit my full time job to write, after all). The number one goal is met, and if I write again that day, great. If not, no biggie. Less stress and guilt, more productivity. That’s a win. Oh, and here are some numbers to prove it. Last week, getting up early (for me) to write before doing anything else on the computer, I kicked out 7528 words between Monday and Friday (I’ve been taking weekends off for family time). That’s an average of 1505 words per day. Near NaNoWriMo levels of words without the NaNo—or rather, mega—levels of stress. Sure, it helps to have a manuscript idea that won’t let me go right now, but if I weren’t producing words, I’d be outlining or editing, and by 9:30 I know that even if I blow the rest of the day, the thing that matters most to me professionally is done. And productivity is contagious. Now that I schedule my email/social media time, the guilt is gone, but I also have a reason not to get lost in the Internet for hours. I’m on a schedule, dammit. I’m a professional. I’m putting my needs first. Following through on my promises to myself. It feels good, and that’s addictive. Like the runner’s high, it’ll keep me coming back for more. I’m plotting to make this my most productive year yet. What about you? How do you keep yourself on track? Nice post, Gwen! I have found that I get more accomplished if I make my “to do” list (in the order of which I want to do each item) and have some direction for the day ahead. 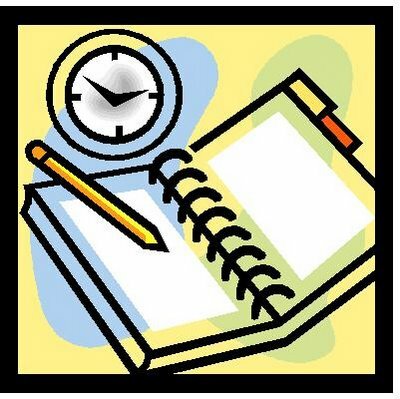 And following your lead, I will even “budget in” writing time, blogging time, learning Scrivener time, etc., along with the necessary household chores and errands to run. Being a retired teacher, I am flexible on most days, but I am most productive when things get done early in the day. I like your suggestion of using a small white board, and I may try that myself. Thanks for sharing your thoughts and ideas this morning. Thanks, CortlandWriter! It seems so simple I almost felt silly talking about it. But, like you, my days are flexible. Which means it’s easy to feel like I have plenty of time “later” and then never get anything important done. I actually did better managing my time when I worked part time, went to grad school full time, and had two little kids at home. I had no choice then. Now I have to artificially create the same sense of urgency. Something about my brain changes when I have a schedule to stick to. I’m more likely to actually write, walk the dog, or clean the bathroom, rather than just thinking about it. 😉 Good luck with your own schedule! Goals and organization always makes sense. Should be taught to kids early on. Always good to go back to what works! You hit the nail of the head with “I’m on a schedule, dammit. I’m a professional.” Like you, I work at home, on the laptop. My one resolution for the new year is to get back to an earlier setting on my alarm, and be at my desk and working by a certain hour. So far so good, most days. I like your whiteboard idea, and will give it a try! One of the reasons I’ve been using the white board is that it’s easy to modify. Things pop up and I change it as needed. Some days I work out early, some days late. Same with the dog walking. Your plan to work with your own rhythms make a lot of sense. Good luck making your own (loose) schedule stick! I’m with you on the use of a schedule. I even schedule in my me-time. Maybe it sounds crazy, but then I don’t feel guilty about lounging on the couch watching my favorite tv show. Great productivity. Keep with it; 2013 will be great! Jolyse: I think scheduling me time is important! Otherwise it’s too easy feeling like we should do something else. That’s another reason I started scheduling my “work” stuff. I wanted my evening hours to be for me and my family without worry or guilt. Thanks! Awesome post, Gwen. I am truly inspired. I always thought of myself as organized, but this puts me to shame. 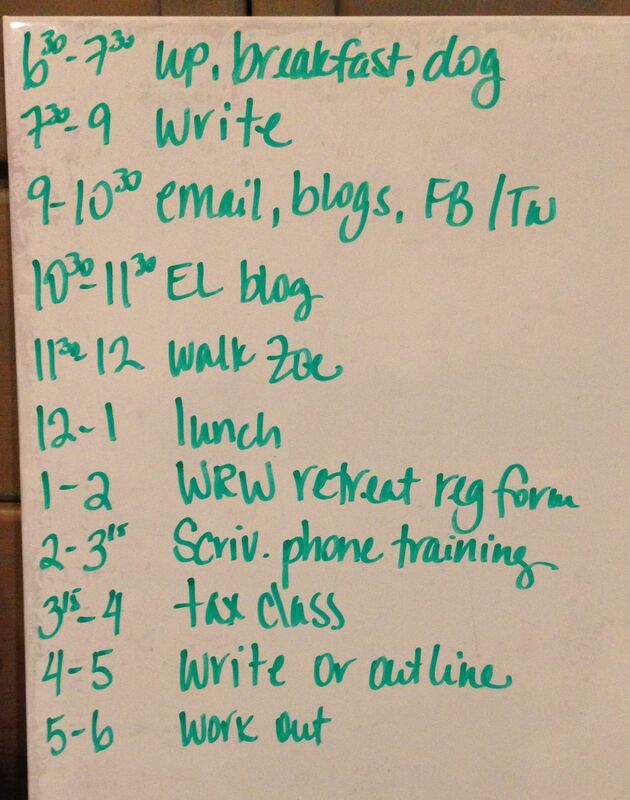 I think I need to start planning out my days like this. I end up wasting a lot of time that I could put to good use if I just paid attention. Today, I was up at 6:30am and at my computer by 7am because I had a meeting at 8 (phone meeting, btw … I’m a telecommuter). As I was sitting there, it dawned on me that it sure would be nice if I could write instead of prepare for my meeting. That got me to thinking about why I don’t get myself out of bed that early every morning and spend 7-8:30 or so writing instead of waiting for my usual writing time that comes after dinner. There is no reason other than that I, like you, am a night owl, and getting up early does not come naturally for me. I think it might be time for a change. Thanks, Dave! I sometimes feel silly sharing things like this, but knowing that my post helped someone always makes it worth it. I tend to go through spurts of feeling really organized, but I’m working to make this a habit so that it’ll stick. So far the good feelings I get every day from having accomplished my goals seem to do the trick. Good luck with your own change! Good post, Gwen. I get up at 6am with my husband. I always shower last thing at night, so it’s quick wash, swipe round the bathroom and make the bed. I then use the time before 7.30 to do mails, FB, look at news headlines etc. 7.30 is dog walk for an hour, then breakfast. I try to be at the desk by 9am. I write in timed periods and fit the washing, housework etc in the in-between times when my brain and body need some activity. I like to know what I want to achieve tomorrow before I give up for the day. And, I always put out tomorrow’s clothes the night before, so I don’t have to think.